Things were going so well with my washcloth exploration…I loved how the ribbing was turning out…until it quite literally turned into a big ball of knots. (I had to cut the needles out, I swear!) I can’t figure out for the life of me where I went wrong…thus ends my foray into pattern designing. ~weak grin~ I went back to Grandma’s tried and true. Sometimes there’s no need to re-invent the wheel. And this buttery, sunny yellow! I know pulling it out of the drawer will make me smile. 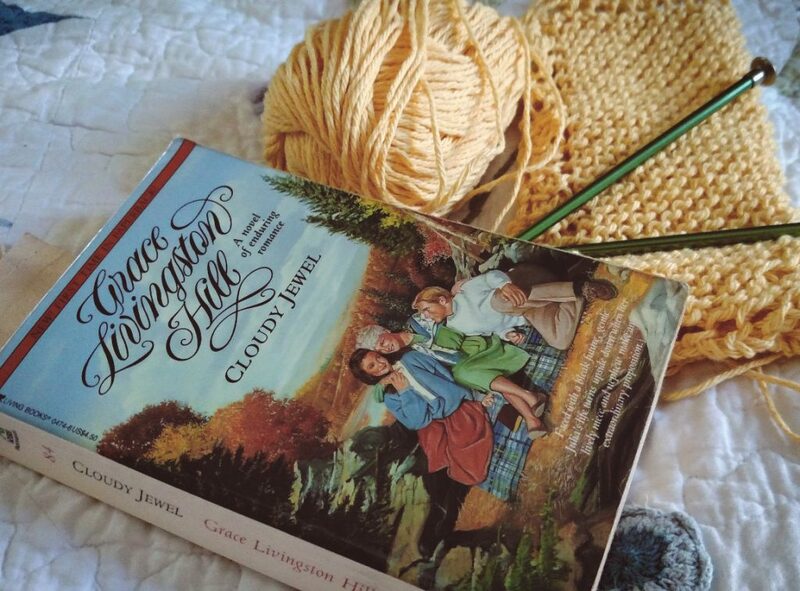 I always seem to read Cloudy Jewel once a year, and it always seems to happen as Fall returns. It’s probably all the delicious descriptions of fall scenery and foods in this one. This one is a bit out of the pattern for GLH as it’s not about a young woman, but an older one, an aunt, chosen by her nephew and niece to be guardian as they go through their college years- not that they particularly need one, but they recognize the need for a mother/soft-place-to-land. (Their mother had died very early in their lives.) It particularly struck me reading this time that Aunt Jewel had some pretty good ideas about mothering teens. That yarn will look beautiful no matter what you make with it. It’s so pretty! Isn’t it funny how we are drawn to certain things in Autumn. Part of me can’t wait for the cooler weather, but I like being outside so much and the long days! Have a creative week. so wonderful to have books to go back to and that are of help! I love the tried and true simple patterns; and that yellow is so cheery!!! I have not read that author yet. I do love fall and imagery of fall especially since it’s summery out still. Bummer about the yarn that is misbehaving!